This Is the End is the type of comedy that has something for everyone. Its cast is a veritable who’s who of today’s most popular comedians (all of whom are playing themselves), there are a number of hilarious cameo appearances and, of course, seemingly endless raunchy jokes. Oh, and it’s an apocalyptic flick that isn’t afraid to show its fair share of gore. When Jay Baruchel arrives in Los Angeles, he’s expecting a weekend of sitting around, getting high and playing video games with his old friend, Seth Rogen. However, Baruchel is reluctantly dragged to a housewarming party held by James Franco where a large number of Rogen’s other, “new” friends are hanging out. Jonah Hill, Craig Robinson, Michael Cera and Emma Watson are among the attendees, but Baruchel doesn’t really know any of them. Feeling left out, Jay asks Seth to take a walk with him to the convenience store for cigarettes. It’s here where the apocalypse hits. Hellfire and brimstone. The two of them quickly head back to the party where everyone is seemingly oblivious to the end of the world happening outside. A massive sinkhole then erupts outside of Franco’s “fortress”, wiping out most of the partygoers. Eventually just Franco, Rogen, Baruchel, Robinson, Hill and an unexpected Danny McBride are left inside the house. The six of them band together in an attempt to survive the apocalypse. As expected with a houseful of comedians, hilarity ensues. This is easily one of the funniest movies I have seen in a while, and a lot of that goes to how willing these celebrities are to make fun of themselves. There is *a lot* of self-deprecating humor here, as everything from Rogen’s acting skills to Franco’s sexuality are the recipients of harsh — but hilarious — jokes. The cameos are even better. Michael Cera damn near steals the show in his limited screen time by blowing countless lines of coke and engaging in illicit party acts. It’s Cera as you’ve never seen him. Another brilliant cameo — one which I will not spoil — happens near the end of the film when a Pulp Fiction Gimp-like character makes an appearance. You’ll never guess who’s under the mask. Also, this movie gets major props for getting Emma Watson to drop an F-bomb. 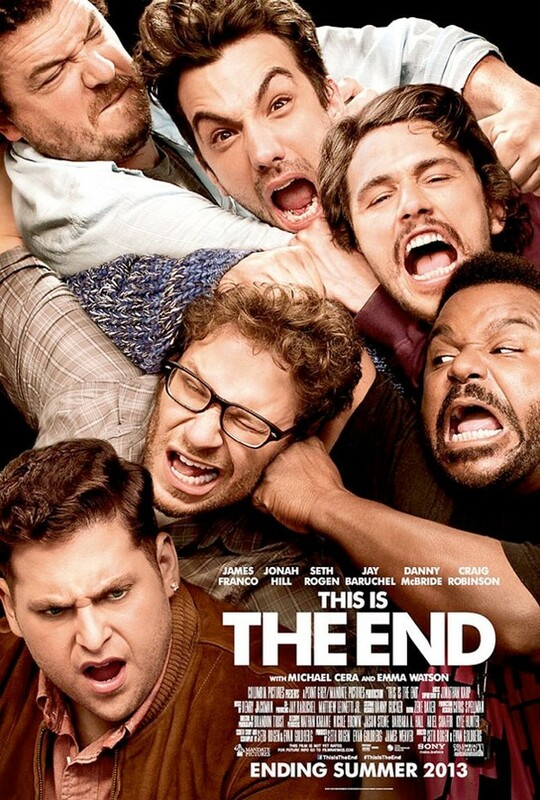 This is the End may be self-indulgent, as it revolves around Rogen (who co-directed and co-wrote this) and his friends, but damn if it isn’t funny as hell. Every character has their fair share of great lines, with everyone playing some version of their own self (though Danny McBride is near full-on Kenny Powers here). The horror elements come in the form of painful character deaths (an impalement and a severed head are just two notable examples) as well as some rather grotesque-looking demons and other creatures of Hell. The CGI is surpisingly well-done for the latter, though the characters are crudely designed (let’s just say some are so well-endowed that Dr. Manhattan would be jealous). All of this ties together to form the best comedy of the year so far. I haven’t laughed this hard in a theater in ages, and nearly every line had the audience in stitches. Who knew the apocalypse could be so funny? Nice review, I really enjoyed this as well. Funniest movie of 2013 easily. Yep, it’s going to be hard to top this one as far as comedies go. Emma Watson? I’m there! Nice review man, I was hoping to see it tonight. Haha, Emma Watson’s cameo is not to be missed. Hope you enjoy the movie! Another positive for this comedy? I got to see this. Thanks, Eric. It’s a riot, Michael. Hope you enjoy it as much as I did! Good review. Still skipping this movie, saving up for when Pacific Rim comes out. Thanks — this one will make for an equally good rental. Nice review Eric. Loved the movie, and had a total ball just hanging out with everybody from my favorite crew: The Apatow crew, that is. Cheers, Dan. Yeah, this one may be their best film yet. Sounds great, hope I get to check this one out soon. I think you’ll love it, man. I am going to see this tonight with the boys. I expect they do not want Mom sitting anywhere near them. Haha — it goes some places that your kids may not want to talk about with you afterward. 🙂 Hope you enjoy the movie! Well, the big Jonah Hill scene was definitely not talked about in the car on the way home. Yeahhh that one might have went a little too far. Did you like the movie overall? I really enjoyed it. But then again, I love raunchy over the top humor. Good deal! That’s some of my favorite type of humor as well. Great review! I can’t wait to see this one, it looks hilarious! Thanks, Sati, this one is a real trip. got to go see it. It’s worth the trip to the theater, for sure. Great review of a truly hilarious film. MAJOR props for Watson dropping the F bomb. Franco and McBride really stole the show for me. Thanks man! It’s so hard to pick a favorite character in this, but I love the story arc for McBride’s character. I still can’t believe who they got to play the gimp… haha. Sounds great. Will have to pick it up on Blu-ray. Excellent review, as always. Thanks, Gary! This one is a riot — I don’t think you’ll be disappointed.